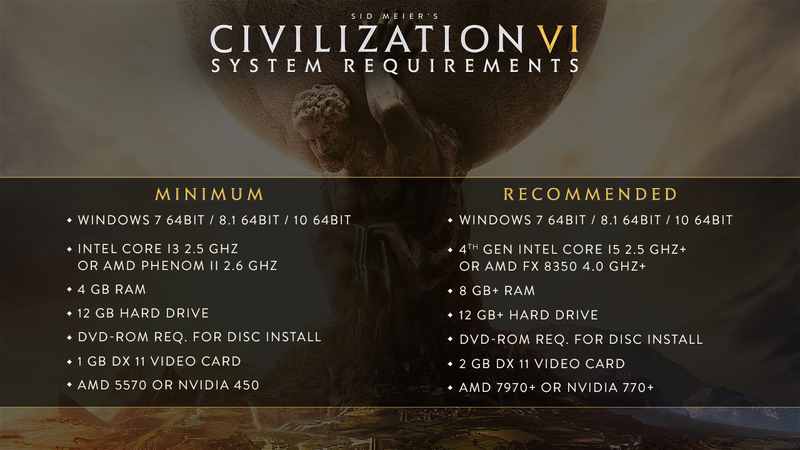 Firaxis has just announced the PC system requirements for Civilization VI. Read more on Civilization VI. I like building huge empires on huge maps in Civ5, the problem is this is too much even for my 6950X CPUs and eventually the games won't load. So, we've been playing the fab new CIV VI for 10 days. My computer can't hack the graphics requirements and I'm going to need a new one. (comp is 4 YO, it's time). Before I order a new comp, I'd like some feedback from folks who have been playing CIV VI. I'm talking playing the huge maps, with tons of military units, for like 200 turns. Have you found that the Firaxis recommended system requirements were adequate or have you hit snags in performance? If so, what do you think would correct those issues. Many thanks to anyone who can provide valuable input on my dilemma. I only but played on Large map size, with 9 Civs. Currently at turn 354(if not more) and Nearly at the end of the game. Running everything maxed except leader shaders(or whatever it's called as it severely drops framerate to around 30, it's a bug I guess) and I get around 60-80FPS at 1440p with a MSI Gaming RX480 8GB. I really recommend the 8GB if possible. Also using 6700k and 16GB of ram. Thanks for the response! I have Intel i-7 with 8 GB RAM, but an older graphics card (Dell XPS 8300). I'm going to try to change out the graphics card and see how that goes. Thanks for your help!